Gangway is the nautical term for a bridge. The gangway forms the accessible route from shore to dock. The design of aluminum gangways’ length, width and attachments are determined by the same factors affecting the rest of the dock. Local Regulations, what’s allowed by the regulating body? Yearly Water Fluctuation, whats the difference between the highest and lowest water levels? Anchoring Method of Dock, some methods may restrict gangway movement. Design requirements of customer, ADA , high loads, low slope. Site weather and conditions such as cliffs, large tides or navigational traffic. 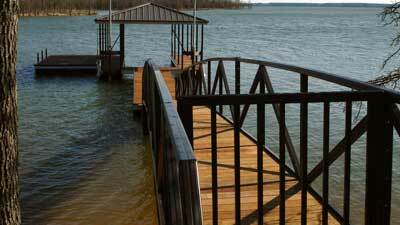 Alumadock residential gangways are made with 6000 series structural aluminum extrusions. Our standard railings feature 2×2 fluted tubing and TIG welded miter cuts for superior weld control and appearance. Gangway floors are constructed with 2×2 tubing joists and cross members, as well as a 2×2 angle truss for superior lateral stability. 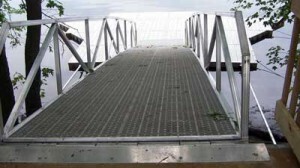 Our gangways are lightweight but strong and can be used with any dock or dock system, new or old. With standard clear spans up to 100′ long and custom gangways even longer, Alumadock can provide you with the appropriate access route for your property. 1/4″ plate gussets used at corners. 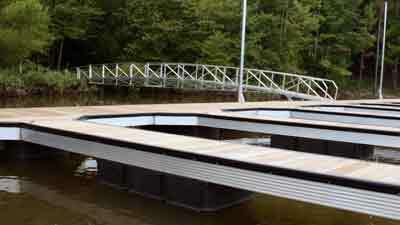 Alumadock gangways are available with several different connection options. Proper connection methods must take into account the requirements of the entire dock system and site. In conjunction with your current dock, we can accommodate huge variations in site conditions with our gangway system, eliminating the need for costly onsite custom building or grading. 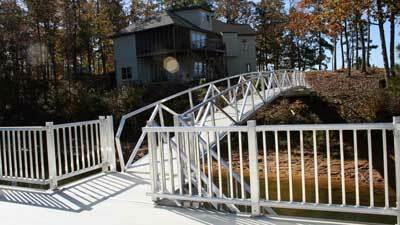 Round out your new aluminum gangway by making it personal with customized accessories. Privacy gates can keep out dogs or other lake friends, while security gates prevent intrusion to the dock while unoccupied. 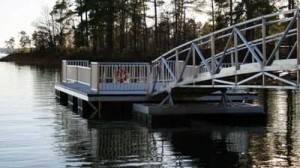 Float stabilizers alleviate the stress of the weight of the gangway on the dock connection, while floating platforms allow two gangways to connect together for chaining. On the ends of the gangway, handicap ramps provide smooth transitions over larger gaps or height differences, when unavoidable. Transition plates are smaller and smooth transitions over small gaps or height differences. Getting onto the dock can sometimes be a difficult or dangerous proposition. Floating walkways normally have gaps in the floor between modules, side to side rocking from waves or just from people walking. 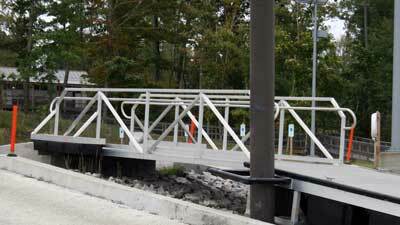 Steel gangways are extremely heavy and require frequent painting. 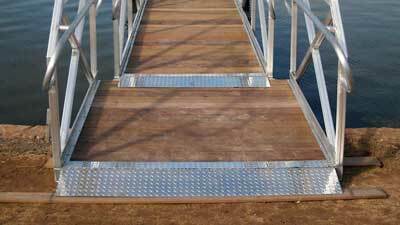 Alumadock’s aluminum gangways offer a strong, safe and economical alternative to the wooden walkways or steel gangways most docks have. 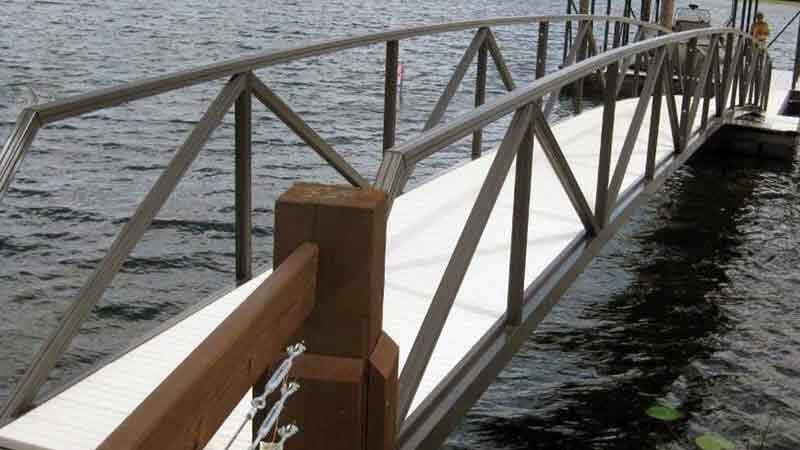 Strong materials and construction ensure longevity and durability while a complete railing from shore to dock, on both sides of the gangway, make certain of safety and protect from hazards while traversing the gangway. ADA style railings allow for higher outside railings and a continuous inner mid-rail, specifically tailored to be as easy as possible for those with arthritis or other needs. 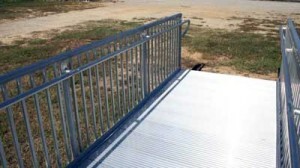 A standard 4′ ADA gangway is normally perfect for residential ADA applications, as it allows easy wheelchair access with just enough room for the wheelchair enabled individual to grab the midrail on either side if need be, while ADA toe kicks prevent crutches or wheels/casters from being able to slip off the gangway. We also offer picket style ADA railings, which improves the aesthetics of the gangway and also creates a fully enclosed barrier meeting IBC requirements.